Last Friday I spoke at the last eLearning Network event of the year, ‘innovation in compliance training’. I’d been really looking forward to the event for weeks, because (as regular readers will know) I’m a big advocate of breaking the mould of the same old dreary, dull compliance training we’ve all seen before. I also wanted to make sure my presentation wasn’t just the same old thing either. I wanted to make sure that I delivered something that really addressed what people wanted to get out of the event. So I decided to do a bit of research and use Wordle to help me achieve this. There are some positive words there: visual, engaging, interesting and action focused are all good things. 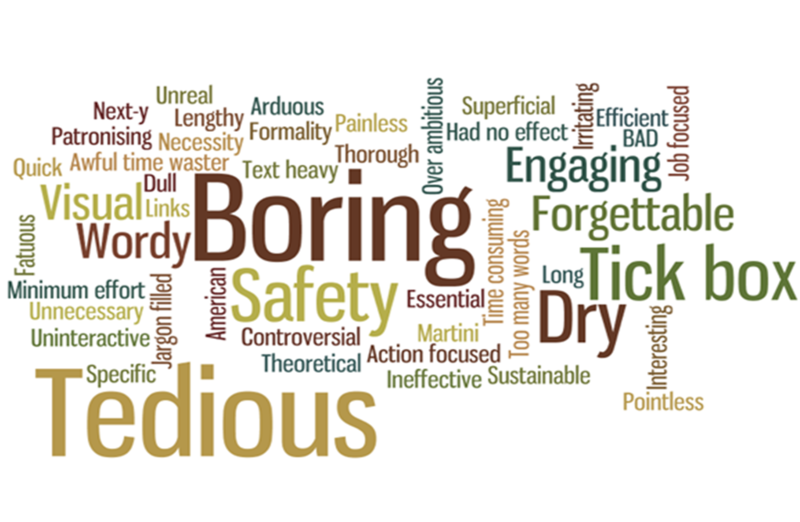 Unfortunately, the most common words are less positive: boring, tedious, forgettable, tick box exercises are the things we need to get away from. None of this, though, is particularly new or surprising, which is why my survey was a two-parter. As a general rule in my experience of e-learning people find it easier to talk about what they don’t like than what they do like, so this was just a warm up exercise. I then asked people to describe the compliance e-learning they want to see more of. The first thing that struck me was that there are fewer words in this case (and I had a similar number of responses to both questions). This is good, because it means we’re all on broadly the same page in terms of what we want compliance e-learning to look like. Throughout the rest of my session (slides to follow shortly) I took each of these aims in turn and offered some tips and suggestions for achieving them. By letting the e-learning and compliance communities determine the content of the session, and then offering practical tips and examples, I hope that I delivered something that was itself engaging, relevant and effective! 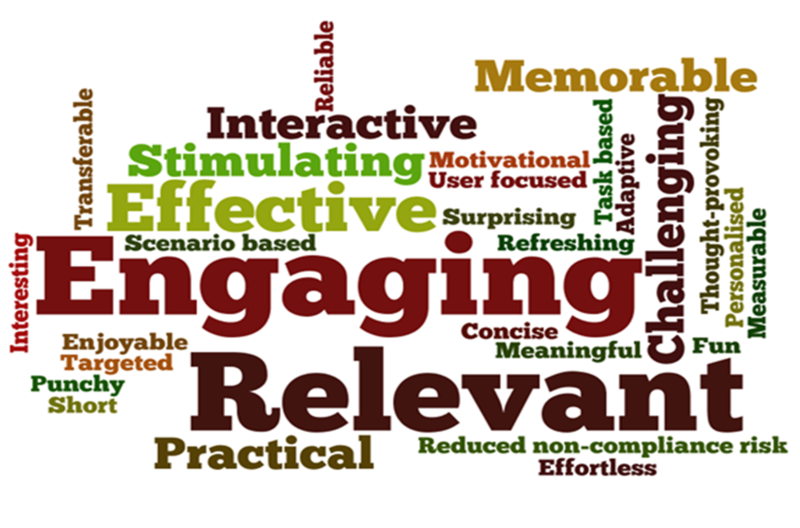 This entry was posted in Instructional design, Learning and training and tagged compliance, effectiveness, eln, engagement, good e-learning, instructional design, learning, relevance, wordle on November 29, 2010 by Stephanie K.
You certainly did Stephanie. I loved the use of Wordle as TNA tool… I think you may have started a craze as I know that I and 1 or 2 other people have ‘jumped on your bandwagon’! Wordle as TNA tool… brilliant! This technique could be used beyond compliance too. I’m thinking technical training in particular. Your last par introduces the idea of co-design. I’d love to see that explored further. What a great use for Wordle (which I love). You’ve opened my brain to looking into all the ways in which I can use this great visual tool. Thanks for all your comments; I’m glad to have provided some food for thought! I’m sure there’s loads more that can be done with this and hope I’ll be able to explore it further, but would love to hear about anything you do building on this idea too. Make sure to come back and share your success stories!